A selection of testimonials and reviews from verified buyers who have purchased our personalized clothing tags! Liked your site a lot. Very easy to navigate. Preview box nice touch. I received my labels and I just absolutely LOVE them. I can not wait to sew them into my Momo Made clothing! Very happy to have found you so easily! User friendly site and ordering! Purchased tags previously. Very happy with your product and service. Your website has an awesome interface for phones! Reorder on my labels. Love how they came out and quality! I love your selection of colors, text and prices! Best I have found! Your customer service ordering support is outstanding. The gal who helped me make the experience easy and helpful……My Mom turns 104 and I’m sending her new clothes for her birthday. Thank you so much! Found exactly what I was looking for for my mother-in-law’s clothing. She is in an assisted living facility. Received my labels today, delighted with them. Thanks a million. This is my second order. Came back for seconds because I ran out of firsts and I liked what I got the first time. I have ordered from you before. Very easy on line choices. Quality product. Thank you so very much for all your helpf with the labels. They look beautiful in the handmade yarmulkes. Heard about you through my knitting group! Many wonderful choices! I have a friend in a nursing home your product will be a bit help keeping her clothes organized. I’m very happy with the labels you made for me, they’re well made and will definitely add a special touch to my hand woven tea towels. Thank you! I thank you very much for your help and efficiency. As I said yesterday, I really like the labels and also the company’s spirit and will surely make more orders with you guys. Thanks again and have a lovely day. I wanted to let you know that we received the woven labels on Friday and are quite pleased. I appreciate your assistance in getting the correct size. It turns out that the 5/8th” really was too big for our current application but the 3/8th” works very well. Thank you again! We received them (Laundry Marker Package with iron on labels) and they work fine. We will come back with a larger order soon. I rec’d my order. It’s perfect. Thanks so much. Great variety with great options. Just received the labels I ordered and they are wonderful! Couldn’t be happier! I am sharing a picture of them and your information in an online sewing group I participate in. Thanks so much! We were very happy with the last set of labels we ordered and look forward to continuing to do business with you for a very long time. Liked the site, not cluttered and easy to use. My younger sister and I love to work out, but she also loves to steal my leggings! Was looking for something everywhere that would allow me to easily label black leggings without damaging them or discomfort. (Letter Transfers). Nice to have a site that has labels for adults and not so childish looking. Shopping Experience is very nice. I have ordered previously and like the woven labels. It was great! Such great products! Labels received by friend and she is very happy with them. Thank you once again for your kindness and understanding. Will certainly pass the good word about you foward. I received the labels and am very pleased with them. Getting ready for school – love your labels! Site is a pleasure to use. Love your selection. The woven labels are ideal for my scarves – thanks! I have ordered previously and love the woven labels. I have ordered from you several times in the past, and I have been happy every time. Thank you!! Very Pleased! Easy to find what I like! Website is very easy to use, good description about products is so helpful, and very user friendly! Used you before! Love your products! Thank you, I love your labels. It was very easy, straight forward, and helpful. This was great, it was easy to fill my order, thank you! Very easy site to follow! I just received my order and there amazing…. Thank you very much.. I will be placing my next order over the weekend… You are wonderful.. I’m completely speechless.. Have a great day. I love your labels and the customer service your company provides. The labels give my clothing that extra “classy” look. Thank you so much for everything. The letter transfers arrived yesterday. Thank you for attention to detail and our needs. You have excellent customer service. Love your labels!We buy them every year for Summer Camp clothes!Thank you! It’s my first order with you!I loved the ease of the ordering process and appreciate your site being a little more web savvy than your competitors. I previously ordered some labels a few weeks ago and fell in love with them and the quality!Thank you so much! Everything was so easy! Prices were great!! I have purchased (Sew-On 3/8″ Classic Woven Labels) from this business before and I am satisfied with the work! I wanted to say thank you for doing such a great job with our labels. Many volunteers remarked how nice they were. They look very good on the blankets the volunteers made. They added a wonderful touch. You made the selection very easy! Thank you! Very easy, clear ordering process. Have ordered several times and like the quality. I found your site so easy to navigate! I have used these transfers since my daughter was an infant. She is now 12! Ordered labels from you 3 years ago. They continue to remain intact and in excellent condition. It was the easiest of all sites I went to. Fantastic customer service over the phone and online. Completely satisfied with your product! I ordered a pack of 100 (Sew-On 3/8″ Classic Woven Labels) sometime last year and only have one left. I love these, they are beautifully made. You’re site is very easy to use and I will definitely be back to purchase more labels in the future! Thanks! You have some of the nicer products that I have seen! My experience was excellent! I received wonderful attention from my phone inquiry. These labels have been very useful, I’m ordering more! Repeat customer, very satisfied with previous order. This is my third order! I love my labels! I am using these in a workshop I’m teaching on quilt label alternatives. I found this site a lot easier than others. I used your labels years ago for my sewing business. Now I am ordering for myself and for my grandchildren to keep track of our belongings. Thank you! This is my 2nd order of labels from your company and I love the woven iron on labels. Your site offered what I wanted for a reasonable price and quantity. Great website! Easy to navigate! Loyal shopper for my home sewing business and now personal uses. Thanks to the high quality! A very clear and easy web page to navigate. Ordered a few times in the past. Your labels were perfect. Thank you! I just wanted to let you know ordering these labels was so easy. I am so grateful for your help! Thank you for such a great ordering experience! Very very helpful customer service! I’ve ordered from you before and my clients love the labels. Great job. Great designs and product descriptions. I am a repeat customer. My kids love your transfer letter iron ons!!!! I am stocking up now for camp because these are the best labels I have ever purchased. They are easy to use and the kids love that they can’t feel the tag. Good morning. The labels arrived for myself and my cousin and we both love them. Thank you so much for your time and energy. Good costumer service and good costumers are the backbone of any business. That being said, I hope that your business continues to thrive. I will certainly order from you again should I continue in my crafting. Just want to let you know I received my order (Iron-On Standards and Stick-On Standard Labels) and I was very impressed with how quickly it was processed. I will be able to make it part of a gift seeing it was received before Christmas. Thank you. Happy holidays. Your web site was very easy to navigate. If I can’t figure out something in about 10-15 seconds I move on to a new site. Your was very easy so thank you for that. I received my labels (Sew-On 1″ Designer Woven Labels) today, Dec. 7, 2015, and I have to tell you that I am very please with the quality, pattern and font. I did have to call to get help with my online order, but your representative was very nice, had lots of patience and helped me pick the correct font for the size of the label I wanted. I will be ordering from you again! I got the iron on labels — they’re great! Many thanks for all your help and good work. My (Iron-On 3/8″) labels arrived today and I LOVE them.Will definitely be buying more of these in the future. Thanks a lot! Hello! The labels came in! I love them!!! Will be ordering more soon! Thank you. Thank you so much for your great service!! It is much appreciated. Like my labels. Nice quality. I can confidently say that your company stands out in its ways to reach out to the customer and I do appreciate this.. I received my order today. Thank you I am very pleased. Oh! Yes! I received them. Thanks! I’m happy. I am awesomely pleased and grateful for your help. Thank you ever so much, I will use you again and I will highly recommend your company to everyone! I hope you are having a delightful weekend. Thanks! You guys are pretty rad! Again, thank you for the very responsive customer service. I am a hospitality professional and am very impressed!! love the iron-on letter transfers, especially with two boys (18 and 14 ) and for all of their of athletic shorts, socks, dry tops , equipment, etc. -my oldest son hated the labels at first, but at the end of four years at school, was happy to leave with all of his clothes and equipment unlike many of his friends. absolutely the best! My order arrived yesterday – Sew-On 3/8″ Classic Woven Labels are perfect and exactly what I wanted! Thank you so much – I will be ordering from your company again, and will definitely spread the word. Y’all’s service is impeccable, I got the labels today and could not be happier! I will definitely be reordering and thank you again for such wonderful service. Got the Standard Value Pack today. Thank you. Trying to get my parents ready for their nursing home room this week and this is one more step to helping me do that. Thank you again. The 1″ sewing labels are perfect! Everyone who gets a quilt with one of those on it is so proud! I got my order. Thank you so much!!! The labels look great! Love them and hope my Aunt will love them too 🙂 Have a great day! The smaller 1/2″ sew-on labels are going to look great and I am going to be very proud when I use them. Thank you very much for your help. Thank you for all your help! I just received my sewing labels. You are the best! I got the letter transfers and they are perfect!! Thank you!! Thank you so much for all the info and your email and call. You have brought back the trust in ordering online and it proves that your business is credible. I received my satin labels, and they are perfect. Thanks a lot. Clothing labels arrived thank you very much they are perfect. Most helpful email I will have all day! Thank you so much for the quick reply and the happy information! I have an excited eight year old heading to camp next week with a bundle of clothes needing labels. She will be thrilled! I will certainly use your company again and look forward to sharing your service with others! I very much appreciate your excellent customer service on this order. I will certainly remember to mention your company’s name when I am complimented on my awesome sewing projects and their cute labels! My labels have arrived, and they are beautiful! Thank you so much! I know that I will enjoy using them and will not hesitate to recommend your company to my friends. I received the shoe labels ,cute. …. thank you also for the Iron-On Standard Labels. My mother is in a nursing home due to a stroke and I need to label, all her clothing. I am now able to start labeling them. Thanks. Thank you! We received the labels and my daughter LOVES them! Thank you for the advice! I greatly appreciate it! Looking forward to doing business with you again in the future! I have received the labels. They are very good. Many Thanks. I received my labels today. Thank you. I am happy with your product and will refer your company to anyone. Thought I would let you know the labels arrived this week. Many thanks they look great. I appreciate your professionalism and dedication to customer service. Thank you. I received the labels today I am very happy with them. Thank you. Just to let you know I received my labels today.. Thanks so much for your help.. I love them! Got my labels in the mail today….they are PERFECT~ THANKS~! And Thank YOU for terrific follow-up service! Hello! I used you guys for my Hook, Line and, Scissors order last year and LOVE the labels you sent me! Now I have started a knit/crochet group at my church — and we are at the point of donating items. Would love to put a simple label on them bearing the name of our group and our church. Thank you so much for your prompt response. I appreciate your service and hope all is well where you are. Look forward to receiving the labels. I just got home and picked up the mail. The labels were delivered to me today!! They are really well done. Good job! Thank you very much for all your help. Just a quick email to say a BIG thank you!! Its my first time ordering labels, i got them just the other day…. they look GREAT! they came eariler than expected… very pleased. I’m just starting out in a small business and will be using you again! also… thank you for replying to my email about my order confirmation…. you guys have be GREAT! Cheers! Ordered Snappy Tags….an absolute breeze to put on tags. My 11 year old son did all his own, couldn’t have seen him helping with the more traditional name tags! I am thrilled with the ease of using the tags, and the fact that once they have been attached, I don’t need worry about checking to make sure the typical labels are still there, after each wash. I will definitely use Snappy Tags again, and I will also be recommending them too. Sappy Tags are really good and quite easy to use. The applicator is very robust. I am using it for all the family as I’m about to go to a uniformed training college and my two children have new schools to go to. I wish I had the option of this product 25 years ago when I went into the military – it would have changed my preparations considerably! Just think of all the evenings I could have had not sewing in labels to every single item of uniform kit – I might have got some sleep in basic training! Our tester found, following the clear instructions supplied, that the application process was indeed quick and easy. She thought that the tags would be especially useful for those difficult to label items such as sports bags, trainers and soft toys. Just fab – saves SO much time! Excellent product. So easy to use. These Tags are fantastic for my son as he attends a special needs residential College where all his belongings have to be named. Once on these do not come off (unless you want to transfer them onto another garment) when the tool is then required. Wish I’d heard about these years ago! Amazing product. Very easy to work out and use. I found making a small hole in the material first, helped the tags go on without gathering the material up. Very quick and easy. Will be using these for many years to come I think! March 2014Snappy Tag UK testimonialExcellent product. Using this product for both my children now. I hate sewing and this product provided the ultimate solution. February 2014Liba S.I am very impressed and grateful for the above and beyond customer service you have provided. I will be sure to tell all my friends.KeelyHi! We received our labels and LOVE them! They far exceeded our expectations – we will be repeat customers! Thank you so much!Abi B.Thanks soooooo much for your follow-up – amazing customer service so unheard of these days!Marcella H., NJIt’s Mine! USA did a fantastic job with my labels. Everything was perfect and they were delivered in time. You should do yourself a favor and use their services not only because they are inexpensive but they make quality labels. Thank you It’s Mine! USA.Barbara P. Bedford, NHDear Itsmine! Folks, I just finished sewing some of the beautiful Its mine! labels into my new creations and want to give you feedback. I am thrilled with the appearance and quality of the labels. They are beautiful because your customer service people worked with me to change my original order into a form which worked better with the name. Thank you for your service and the wonderful final product. Now I am going to order some more with different colors!Nan A.Just received my order and the labels are too cute. I just love them. Thanks and it was a pleasure to do business with you.Pam ScheidThank you for your responses to my order. It is so refreshing to do business on-line with “real” people who actually correspond with their customers. I know Kathryn will enjoy personalizing her extraordinary knitted garments.EdieI just had to email you today, I placed this order on the 6th of June, and received my order today! Fantastic service, and as with my order before this one, the order is perfect, and it arrived in shorter time that I expected. A huge thank you to all of you at Its Mine, you folks do an AWESOME job! !Ana P.Thank you very much for the WONDERFUL customer service! !R.Q.B.I recieved the new labels. Thank-you. I am so delighted with the quality- both of the product and the service. Thank-you again!DarcyHey there. I just wanted to thank you for your great customer service. We got our labels just in time to iron them on before our show on Sunday. Whew! It was a success. Thank you so much.Margaret G.I received the labels today, and they are perfect. I appreciate your prompt response and excellent service. I’ve already recommended It’s Mine to friends.Nancy D., VAJust wanted to let you know that your “fabric labels” were received and I was very impressed with them and with your service. I’ve already used them on some of my products. Thanks again! I do plan to continue doing business with you.Carol K., NYI just wanted you to know that I really like the woven iron on labels. They work beautifully on my daughter’s clothing. A winner in the household!B. T., BelgiumI received the labels for Marguerite Couture! Really high quality! The way you dealt with the order denotes an outstanding customer service! Will surely order from you guys from now on!KateI’ve just received the labels and they are beautiful! Thank you so much for great quality and affordable price.Sister C., Nazareth House, CAWe run a nursing home and every item of clothing needs to be named if it is to get laundered and returned to the right person. Your Sew On Woven Labels are perfect for our use.Jo Ann G.Dear itsmineusa, I just wanted to commend you and your business for a job exceptionally well done, and also for your outstanding customer service. I just received the labels that I ordered less than two weeks ago, and they are beautifully done – a top quality product. Besides fulfilling the order much more quickly than promised, you were so conscientious about communicating with me, and clarifying my preferences. This type of customer service just doesn’t happen anymore, and I am very impressed with the way you folks do business! After finding “itsmineusa” on the Internet, I took a chance and ordered from you. I’m so glad I did! You’re the best.Isabelle M. NYThis is the first year ever that our household finished school and camp with nothing missing. Thank you!Sonja G. , CAI have already ordered more labels from you. They are wonderful. Thank you for offering such a great product on such a user-friendly website!Gina K., VAI received the labels today and they look great! 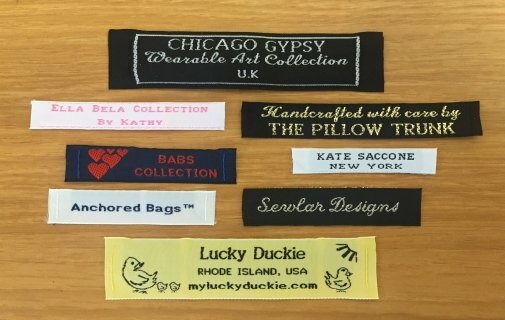 I have a small business making purses and am using the labels inside. Thank you for making this happen! I will call you when I am finished with this first bunch and need more.Kathy S. , COYou are amazing! Thank you so very much for having my orders put through so quickly. This will give me almost four whole weeks to label my 3 daughter’s ‘things’ prior to them leaving for camp. I will recommend you to anyone needing labels. Thanks again.Susan W., Bright Babies Day Care, NJYour Stick On labels are fabulous for keeping track of baby bottles and sippy cups etc. amongst the babies and toddlers in our Day Care Center. We can now identify easily which child should be drinking from which cup… especially important where they have special dietary requirements. We use them to mark medication bottles too!Claude L.I received the labels today for my mom. They are beautiful, and of excellent quality. I just called her and she just lit up with excitement in her voice. My mom has been sewing for over forty years. She has never had a label made for any product she created. Now with pride and these beautiful labels in her retirement something so small and elegant like this can make her so happy. I just appreciated it.Mrs. S., WAWe got the labels in the mail today and they are perfect! We will definitely be ordering more labels if we need to from your company and recommending others to you for the quality and the fantastic customer service.Pamela S.I received my sew-on labels today and they are completely PERFECT!! I’ve never ordered from your company before but I’m thrilled I found you and will use you again!! Thanks for making my labels EXACTLY how I wanted them!! – one extremely happy customer.